The most economical way to buy AlgaeCal Plus and Strontium Boost is with our Bone Builder Packs. Your bone density will begin increasing the first day you supply these nutrients, but it takes about 6 months to become measurable on DEXA scan, so get started today. A six month package includes 8 bottles of AlgaeCal Plus and 6 bottles of Strontium Boost. Please note that AlgaeCal Plus dosage is 4 capsules per day to increase bone density- just like in the clinical studies- so you need 8 bottles for a six month supply. Remember, AlgaeCal Plus together with Strontium Boost are GUARANTEED to increase your bone density in six months. Bone building is a life long process requiring all the nutrients your bones need for a lifetime, so we have provided best possible pricing with the 12 month Bone Builder Pack. See our guarantee. AlgaeCal Plus OverviewAlgaeCal marine algae supplies a full spectrum of calcium, magnesium, and over 70 trace minerals. Full clinical doses of vitamin D3, vitamin K2, boron, and additional magnesium have been added to the algae powder to make AlgaeCal Plus the key piece of your bone building arsenal. AlgaeCal wild-harvested, plant-sourced calcium is derived from a South American marine algae called algas calcareas. The entire kiwi-fruit size algae ball is hand harvested, sun dried, then milled into a powder. There is no extraction process or additives used – just pure whole food. ​The AlgaeCal plant draws calcium and 70 other minerals from sea water and pre-digests it for you much like a carrot or potato root breaks down the in-edible rock minerals in soil converting them into a useable form your body recognizes as food. Most traditional calcium supplements are made from pulverized limestone or marble. AlgaeCal plant-digested calcium is so body-friendly that 97% of AlgaeCal’s calcium goes into solution in 30 minutes using USP standard tests simulating stomach conditions – proving it is very bio-accessible. Algas Calcareas is Certified Organic and KosherOrganic certification attests to both the purity, and to the sustainability of this algae. A third party organization called IBD Certificacoes has certified that the harvest area is free of pollutants and that the harvest levels are allowing this resource to regenerate. IBD is held responsible by the USDA and IFOAM (International Federation of Organic Agriculture Movements) ensuring that AlgaeCal is the highest quality, wild-harvested ingredient. See Organic Certification for Algas Calcareas. Algas Calcareas is kosher certified through Natural Food Certifiers. See Kosher Certification. Minerals are the KeyDid you know that clinical studies demonstrate trace minerals are important for bone growth in addition to calcium and magnesium? Patent pending AlgaeCal is more than a plant-source, whole-food calcium supplement. AlgaeCal also contains high levels of natural magnesium, plus more than 70 trace minerals, and phyto-nutrients. You get a full spectrum of minerals and plant nutrients working for you instead of one or two elements like most calcium supplements provide. The “Plus” in AlgaeCal PlusAdded to the calcium and mineral algae foundation are key bone building vitamins D3 and K2 in full clinically supported doses. These two fat soluble vitamins work synergistically to support calcium absorption and distribution to your bones. Also, as magnesium is usually deficient in the Western diet, and as we have increased need for it in presence of stress, additional magnesium has been added to the naturally occurring algae magnesium. Several studies show Boron playing a role in bone health at 3 mg per day so this important mineral has also been topped up in the AlgaeCal Plus formula. With vitamin D3, vitamin K2, additional magnesium and boron added to the algae superfood foundation makes AlgaeCal Plus the most complete calcium supplement on the planet. Strontium Boost OverviewStrontium Boost is composed of strontium citrate. The earth element strontium (naturally found in small amounts in your food) is combined with citrate (common in fruit) to bond the two into strontium citrate. 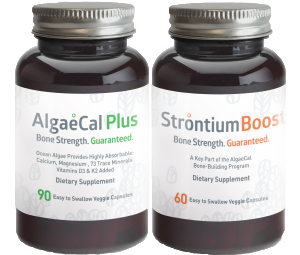 Strontium Boost taken together with AlgaeCal Plus is guaranteed to increase your bone density in six months. Strontium, a similar mineral to calcium in many respects, is naturally found in your bones. Strontium is naturally present in trace amounts with around 100 micrograms in every gram of your bone, and one Finnish study estimated you eat about 2 mg per day in your daily diet. Some argue correctly that strontium can overstate DEXA scan bone results by as much as 25%. If this is the case the positive results in the AlgaeCal studies are still outright increases in bone density in older adults who should be losing bone. It should also be noted that strontium studies show reduced fracture risk independent of bone density readings. FactsAlgaeCal Plus contains 90 capsules. If you are maintaining your current healthy bone density, 3 capsules per day is sufficient, making this a one month supply. 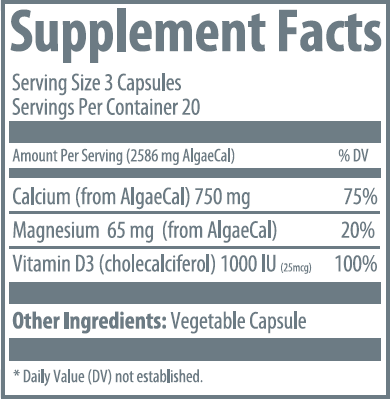 To increase bone density, take 4 capsules per day, making AlgaeCal Plus a 22 day supply. Also, kindly note the Supplement Facts box shows the amounts per 2 capsules – so the amount shown of each ingredient is only half of the daily amount provided. In other words double the amount shown on the Supplement Facts to get your daily amount. (Federal law requires this labeling practice).